Gathering qi to wash the internal organs. Qigong is the foundation of the Hunyuan Taiji system. Qigong, literally “qi skill,” is a term that, broadly speaking, encompasses the whole of the system. Our goal as practitioners of Hunyuan Taiji is to cultivate skill with qi (the body’s subtle energy, or life force) in order to promote robust health, martial prowess, and spiritual insight. Thus, when practiced properly, Taiji form and push-hands (two person drills) are qigong practices. More specifically, the term qigong is also used to refer to certain types of exercises. We practice sets of these qigong exercises to acquire the skill or “gong” required for proper practice of form and applications. The cultivation and use of this skill is what makes Taiji an internal martial art. 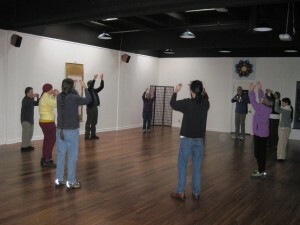 Fundamentally, qigong practice is the core of the health, martial, and spiritual benefits of the system. Wuji Meditation The goal of meditation is the cultivation of stillness – merging with what is without polarity (literally, “wuji”). From this stillness, the one hunyuan qi emerges and becomes taiji (supreme polarity). Using our mind-intent, we then direct the qi through the movements of qigong or taiji form practice. All practices in Hunyuan Taiji emerge from and return to stillness. This is the secret of Taoist cultivation and the key to the deepest mysteries of Taiji. Hunyuan Gong The most important of the Gong methods, Hunyuan Gong is designed to accumulate qi from the environment and use it to augment our prenatal qi (our genetic inheritance). This opens the qi-meridians of the body, forms the middle dantian (where qi is stored in the body) and thus promotes health, prolongs life, deepens stillness, and increases power. Matt’s wife Hiromi healed herself of a whiplash injury practicing this set, after a year of many different therapies failed. Many such cures have been reported. Chansi Gong Chansi or “silk-reeling” Gong is a set of exercises that train the spiralling movements unique to the Chen-style Taiji system. This set also includes joint opening exercises. When the dantian qi is full and the joints are open, the spiraling movements of silk-reeling convey qi throughout the channels to connect all of the eighteen joints of the body together as one. This generates the tremendous power and fluidity of movement that is the hallmark of Chen style. Fangsong Gong Literally, relaxing skill, Fangsong Gong is an apparently simple set of 18 movements that is actually extraordinarily profound. In Hunyuan Taiji we cultivate a deep level of relaxation in our bodies and minds that is not slack, but buoyant, vibrant, and lively. This set trains this deep relaxation that is one of the hallmarks, and greatest strengths, of Hunyuan Taiji. Stick & Ruler Gong Stick and Ruler Gong is actually two sets of qigong exercises practiced with different devices. The stick is used to train the twisting movements employed in qinna (joint-locking) using internal skill – another hallmark of Chen-style Taiji. The ruler is used to intensify qi harvesting and circulation (dantian training) and to deepen stillness practice. These exercises are considered advanced.